Bob Marshall (left), Mike Kelly (center), Ken Marshall (right). Marshall Roofing and Sheet Metal Co. Inc. principals have a combined 80 years experience in commercial/industrial roofing. Originated as Federal Roofing in 1944, Marshall Roofing and Sheet Metal Co., Inc. has helped commercial/industrial building owners cope with New England weather for over 50 years. 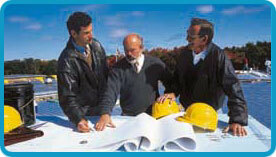 The company has a long tradition of safe, quality roofing installations. Marshall works with private owners and their representatives, general contractors, specifiers, and municipal, state, and federal contracting authorities. Marshall Roofing and Sheet Metal Co., Inc. is fully bonded and Y2K compliant. Through a needs analysis/problem solving/cost estimate process, Marshall principals consult with clients to develop a roofing system best suited to the needs of, and the budget for, a given structure. Marshall's portfolio of experience encompasses all of the major commercial/industrial roofing systems.